There are warning signs on the inside and outside of your building you can look out for to help prevent the potential for complete brick masonry failure. Brick is some of the most durable building material out there, proven to last for centuries, but that doesn’t mean it can’t incur damage and failure over time. If caught early on there are simple fixes that will restore your building back to its original state without costing an arm and a leg. On the other hand, if you ignore the warning signs you are going to eventually see your structure in ruins. Here are 5 warning signs to look out for indicating potential masonry failure and the need for Toronto masonry repairs. If you notice your interior wall cracking in a diagonal pattern near the windows or anywhere else you may have a deteriorated shelf angle. Shelf angles are generally made of steel and can be found on every floor as well as over window headers. They are usually attached to the concrete frame and provide support to the brick veneer. When placed over window openings they work to support window headers. There are two things that tend to cause shelf failure, including overexposure to water, or if the brick wall expands in a vertical direction. If a shelf angle is failing it is applying a great deal of pressure to the veneer wall. Over time this creates a dangerous situation in which the bricks are forced to hold up way more than they can handle. As a result, bricks begin bowing and eventually become so weak that a strong enough windstorm is all it takes to actually rip the entire brick wall clear from the building. Even the smallest cracks in masonry joints needs to be fixed right away, as any sized crack can let water inside. This water creates a world of damage during freeze and thaw cycles. As temperatures fluctuate the water freezes and expands and then defrosts and melts back into water, all the while putting the wall under consistent pressure causing the holes and cracks to grow larger. The interior of your home is often a great place to identify exterior masonry failure. If you notice cracks in interior plaster it could be related to masonry issues. 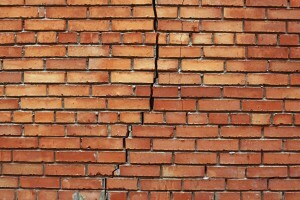 If the exterior cracking measures between 2 mm and 5 mm in width chances are there are issues that need to be addressed. Other visual signs of masonry damage on the interior of a home include moisture spots on ceilings, drafts penetrating through walls, or a sudden deformity in the appearance of doors or windows. Interior warning signs are often related to cracking of the foundation and thermal movement, all of which impact exterior masonry as well. If you notice pieces of mortar missing in between bricks you need to have a professional out as soon as possible. At the first sign of loose mortar something needs to be done. In the mean time, water is free to fill up these holes, expand and contract, and create unlimited damage. On average bricks need to be repointed about once every 15-20 years, although a lot of mitigating factors can alter that time frame. If you have recently had your bricks repointed and you are prematurely seeing issues the wrong type of mortar may have been used for your project. New mortar needs to match original mortar, and it shouldn’t be stronger than the surrounding materials. If new mortar joints are too strong they will begin to put a lot of extra pressure on brick causing instability and damage. Replacing mortar is more cost effective than replacing bricks down the line but repointing is a skill that requires plenty of experience and talent. Going with the lowest bid for repointing is never a good idea, not that you need to go with the highest bid, but finding someone to do this job on the cheap will be more expensive in the long run and isn’t worth it. At the first sign of masonry failure contact Turnbull Masonry for superior Toronto repairs that keep your masonry structure strong at its core.